With all the talk of SpaceX and Blue Origin sending rockets to orbit and vertically landing part or all of them back on Earth for reuse you’d think that they were the first to try it. Nothing can be further from the truth. Back in the 1990s, a small team backed by McDonnell Douglas and the US government vertically launched and landed versions of a rocket called the Delta Clipper. It didn’t go to orbit but it did perform some extraordinary feats. The Delta Clipper was an unmanned demonstrator launch vehicle flown from 1993 to 1996 for testing vertical takeoff and landing (VTOL) single-stage to orbit (SSTO) technology. For anyone who watched SpaceX testing VTOL with its Grasshopper vehicle in 2012/13, the Delta Clipper’s maneuvers would look very familiar. Initially, it was funded by the Strategic Defence Initiative Organization (SDIO). Many may remember SDI as “Star Wars”, the proposed defence system against ballistic missiles which had political traction during the 1980s up to the end of the Cold War. Ultimately, the SDIO wanted a suborbital recoverable rocket capable of carrying a 3,000 lb payload to an altitude of 284 miles (457 km), which is around the altitude of the International Space Station. It also had to return with a soft landing to a precise location and be able to fly again in three to seven days. Part of the goal was to have a means of rapidly replacing military satellites should there be a national emergency. The plan was to start with an “X” subscale vehicle which would demonstrate vertical takeoff and landing and do so again in three to seven days. A “Y” orbital prototype would follow that. In August 1991, McDonnell-Douglas won the contract for the “X” version and the possible future “Y” one. The following is the story of that vehicle and its amazing feats. For military purposes, it was to have “abort-once-around” (AOA) capability. This meant that it should be able to land after only a single orbit, something which was a contingency for the Space Shuttle, but unlike for the Shuttle, the landing was to be at the launch site (the Shuttle could AOA to either Kennedy, Edwards, or White Sands). If takeoff is to the east then there’s no a problem. But military flights sometimes use polar orbits, i.e. a north-south path. The Earth is rotating east-west and if the orbit is north-south then after a single orbit, the Earth will have rotated the launch site around 1,500 miles (2,400 km) to the east. To cross that distance an orbital Delta Clipper would have flat sides and large control flaps. It would re-enter the atmosphere nose-first and use those control surfaces to maneuver. It would then rotate so that the tail is facing down to land vertically. These design requirements were reflected in the experimental versions. The “X” version was given the name Delta Clipper Experimental, or DC-X. The “Delta” in Delta Clipper was a nod to the expertise lent from the Thor-Delta rocket program for which McDonnell-Douglas was a manufacturer. The “Clipper” refers to the fast Yankee clipper ships of the 1800s. The two words were selected to make up the initials DC, a reference to the Douglas DC-3 aircraft of the 1930s and 1940s which revolutionized air transport. It was 40 feet (12 m) high and 13.3 feet (4 m) in diameter at the tail. It used four RL10A5 rocket engines built by Pratt & Whitney Rocketdyne, now a part of Aerojet Rocketdyne. Reaction controls consisted of four gaseous oxygen-hydrogen thrusters. The outer aeroshell was made by Scaled Composites, the same company which in 2004 flew the first privately funded suborbital spaceflight with SpaceShipOne. The DC-X was designed to be simply built from commercial off-the-shelf parts at a cost of $60 million ($118 million in 2018 dollars). It even used the F-15’s flight navigation system. Simple also meant it was to run as autonomously as possible, in the end requiring just three people in the control center: two for flight operations and one for ground support. Apollo astronaut Pete Conrad sat at the controls for some flights. Between 1993 and 1995 the DC-X flew 8 times. Here are the highlights. These flights rose vertically 150 and 300 feet, respectively, then translated 300 feet horizontally, and finally flew straight down for a soft landing. Helium bubbles formed in the propellant lines resulting in unequal thrust from the engines at takeoff. It rose at an angle, but the onboard controls compensated and it continued its flight, this time to 1200 feet. Funding ran out after the 3rd flight when the SDIO program wound down but further funding was found from NASA and DARPA (called ARPA at the time) and flying soon resumed. The DC-X flew vertically to 1,500 feet, rose further while following a curve to 2,600 feet, and then flew laterally 1,050 feet from where it took off. It next reversed direction and climbed to 2,850 feet to over the landing pad wherein it descended. Flight 5: Flying with a hole in the side. A minor explosion dominated this flight. Prior to launch, some of the hydrogen gas is vented while the propellant lines are chilled. During engine start, some of the vented hydrogen gas ignited, causing a fast burn and an overpressure which blew away a sizeable section of the aeroshell. Despite this, the DC-X continued to fly perfectly. After seventeen seconds, flight manager Pete Conrad commanded the DC-X to go into the autoland sequence. The DC-X then stopped all upward and forward flight and soft-landed. Primarily, this flight tested flying at a constant angle of attack, rising at a constant angle to 4,350 feet. It also did pitch over maneuvers and included the first to use of GPS data and differential throttling. This flight was most notable for carrying out a 75° reverse pitch over maneuver, basically tilting the vehicle to an almost horizontal orientation. The side flaps, engine throttling and the four gaseous oxygen-hydrogen thrusters were also tested. Once again, the altitude record was raised, this time to 5,700 feet. Flight 8: Nose 10 degrees below the horizon. This one tested the maneuvers it would have to do after atmospheric re-entry during an “abort-once-around”, though during an actual re-entry the velocity would be far greater. At 8,200 feet, the DC-X pitched the nose over to ten degrees below the horizon and moved nose-first back toward the landing pad. It then rotated 138° to a tail-first attitude. Unfortunately, the flight ended with a hard 14 feet/second landing which cracked the aeroshell. Funding had already been cut by the time Flight 8 went up and so there was no money for repairs. After flight 8, NASA agreed to take on the Delta Clipper program. A new, upgraded vehicle was built designated the DC-XA, the “A” standing for Advanced. an improved reaction control system from Aerojet. The DC-XA flew for only four flights. In the first one on May 18, 1996, heating due to a planned slow landing damaged the aeroshell. It was repaired and two flights were made in quick succession on June 7th and 8th with only 26 hours between them, proving that a complex launch vehicle could have a turnaround similar to that of a jet aircraft. The June 8th flight also set records with a height of 10,300 feet and a 142 second flight time. The July 31st flight was the fourth and final one. A helium pressurant line which was supposed to supply hydraulic pressure for one of the landing struts was not connected and the strut failed to deploy. As a result, and as the end of the video below shows, the vehicle tipped over during landing, falling to the ground on its side. Unfortunately, one of the liquid oxygen tanks had cracked during testing. The structural damage due to the fall would have been fixable but liquid oxygen from the cracked tank worsened a fire which resulted in more damage than could be repaired. There is speculation that NASA had been shamed into taking on the Delta Clipper project due to its public success under the SDIO. But NASA already had its own SSTO project, the Lockheed Martin VentureStar, and so it cancelled the Delta Clipper, citing budgetary constraints. 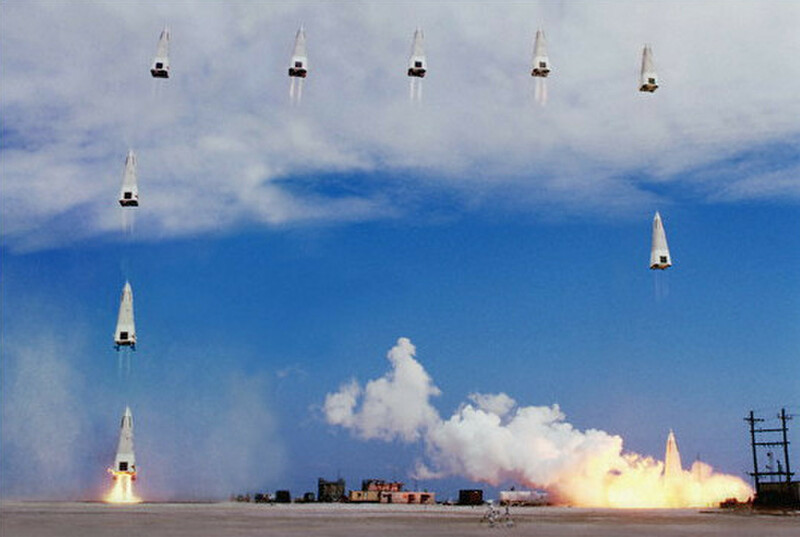 Despite having ended in a crash, the Delta Clipper “X” vehicles were a success, demonstrating VTOL, quick turnaround, and the types of maneuvers necessary for an “abort once around” back to launch site. And they looked every bit as amazing at the time as watching SpaceX’s and Blue Origin’s VTOL flights do now. The images of DC-X’s Flights 5 and 8 were taken from this Flight for Cheap Access to Space video. Thanks to [Daniel Matthews] for the idea for this article by reminding us about the Delta Clipper in a recent comment to our post about doing yaw control using a model of a Falcon 9. ← What’s Inside A Scientology E-Meter? If only someone with funds can grab this idea, add modern tech and engineers that would be breakthrough in reusable space crafts. Maybe we can find at least 2 people with that vision. Luckily they are keeping NASA away from it. Falcon 9, New Glenn, New Shepard, and BFR/BFS are all closer to Delta Clipper than XS-1 is. Masten lost because they a newcomer with no track record. There was no way DARPA was going to select a company like that in something as high stakes as launch systems. NASA IMO should be funding Masten just to see what they can do because they look to be a outlier and it would be cheap. I beg to differ. No one else has more experience with rapid reuse of rocket systems and VTVL. Sure, it’s a risky bet, but awarding the contract to Boeing is a guarantee that the launch system will never see affordable commercial usage. It’s either a chance of a gamechanger or a guarantee of status quo mediocrity. DARPA is supposed to be all about taking big risks with chance of a huge payoff, not awarding “safe” contracts. That’s for other organizations. I think NASA should fund Masten just to get a lunar lander on the cheap as the Xeus concept seems very sound and would be very capable. It can land up to ten tons expended or five reusable which is enough to bring things like bulldozers and excavators to the moon. On experience despite being a new comer Masten had a lot of experience with rapid reuse and have done over 500 flight with 221 of them on Xombie. …..why is this lucky? Man, if you are going to slander 50+ years of technical excellence in space flight, at least bother to come up with a reason why. NASA’s only problem is that it is a regressive dinosaur, whose existence only serves for pork-barrel spending by congress. Well, there is SpaceX’s Big “Falcon” Rocket. While most of the details are different (propellant types, engine types, materials, etc) the overall premise is not that far off. It’s a fully reusable VTVL rocket. Please stop saying Blue Origin is putting craft in orbit. It isn’t. They are shooting a rocket straight up, and having it come straight back down again. Putting SpaceX and Blue Origin in the same sentence is irritating. It’s like comparing a bottle rocket to the concorde. You mean like today New Shepard goes to 119km? 19km above agreed space line. Reaching 100km is not that difficult. To orbit means you also need accelerate sideways until the planet curves away from you as fast as you fall. In that topic I’m far on left in Dunning–Kruger curve. Is it not a matter of “strap more fuel tanks to that tube to get higher” ? Capsule and landing on fire looks good for layman. Noooooo. Lifting something to 100km altitude takes about 3% as much energy as throwing it sideways fast enough to keep it from falling right back down. Bingo. This is what few people appreciate. It is a matter of getting faster, not higher. At 100 km, the craft needs to be traveling about 28 000 km/h in order for the Earth’s surface to curve away as fast as the craft is falling. With only the height, shut off the engine and re-entry will begin shortly. With both the height and the speed, shut off the engine and continue in orbit. To “space” is not quite the same as to “orbit”. The article does not say Blue Origin has already put a craft in Orbit. The article says there is talk about Blue Origin sending rockets to Orbit. New Glenn, the first orbital rocket design Blue Origin intends to fly is in development. The launchpad it will be used has already been leased at Cape Canaveral Air Force Station. Full scale BE-4 engines (New Glenn’s first stage engine, 2nd stage will use the flight proven BE-3) have been built and fired. The Blue Origin factory building on Merritt Island is operational (CO issued, people working there daily) with tooling and manufacturing setup under way. Their goal of first launch by the end of the decade is still well in hand. Why is it wrong to talk about that? Is it wrong to talk about SLS and Orion, too since they haven’t orbited yet? What about SNC’s Dreamchaser? What about BFR? No one was prohibited from talking about SpaceX sending rockets to orbit before the 4th launch of Falcon 1 succeeded. Orbital spaceflight research and development is not a forbidden topic. Thanks. I was just about to say much the same thing when I saw your comment come in. As you guys have pointed out, there’s a big difference between going up to 100km and landing vertically back on Earth (not that that isn’t a significant accomplishment) vs launching and landing the first stage of an orbital booster. So I wasn’t thinking about the New Sheppard, I had the New Glenn in mind. “Is in development” however, New Glenn is still vaporware for right now. SLS and Orion are much further along than SpaceX BFR and New Glenn. Full scale BE-4s have been built and tested so NG is not completely vaporware at this point. Until we see a Blue Origin craft successfully attain an orbital trajectory, make a few orbits, survive the ~18000mph re-entry, and land – all without without self-destructing they are hobby spacecraft. A fun pet project for Bezos to burn his billions on. Those who do remember history will find other ways to screw-up. I award you 3 Internet Merits! Hey Steven. I think *a few things* could be further from the truth. Please be less hyperbolic or this place will turn into Buzzfeed. Assuming you meant me, can you clarify “a few things”? Searching didn’t help. Not that I’m immune to hyperbole. Over-exaggeration is a lazy journalistic habit, and I’m disappointed to see it on this site. It reflects tremendously poorly on the author. Almost anything could be further from the truth. The claim that ULA has any real intention of reusing any parts of their rockets in the next decade is probably farther from the truth, despite their marketing otherwise, and the claim that anybody besides SpaceX and BO were actually on the road to making reusable orbital rockets before the year 2000 is patently, obviously false. Almost nobody thought it was physically possible. DC-X/A had no re-entry capabilities; its guidance and navigation was never sophisticated enough, and in fact was never developed, and its composite shell (designed to hide the obviously non-orbit-capable hardware underneath behind the facade of a real vehicle) would have melted on atmospheric reentry. It was way too heavy to fly even the notional orbital abort/landing mission, even if it started in orbit. Single stage to orbit has never worked on Earth and basically never will for missions intending to carry non-single-digit-percent mass-fraction payloads. Yes, DC-X was cool, but compared to the Falcon 9 or New Glenn, it’s a joke. It’s arguable that the project wasn’t an attempt to “try” reusability, but an attempt to look like they were trying. The proof is in the numbers: SpaceX has spent around $2-3 billion on Falcon 9; Blue Origin has spent a few hundred million on New Shepard and a few billion on New Glenn. The entire DC-X program cost was about $110 million in 2018 dollars, less than even the cheapest United Launch Alliance launch contract as of a few years ago. It was a toy. You could compare it to the SpaceX Grasshopper or New Shepard, except New Shepard can actually get to the Karman line with some payload. DC-X/A was basically an amped-up, massively funded version of what can be seen in this video: https://www.youtube.com/watch?v=_kd64VE3A1c. It was great for the time, but it was just a technology demonstrator and the parent organizations of the project had no intention of following through unless it was bankrolled. I would hazard to say that it was a waste of money, because the value of technology demonstrators is underestimated. This entire article’s premise is analogous to that of an essay I read a while ago that explained, in a heavy-handed manner, that the Wright Brothers weren’t the first to “try” making a flying machine, and thus don’t deserve much credit for their work, pointing to people like Otto Lilienthal and Icarus who had no real conception of how the thing could be done. Yes, it’s a great educational piece of history, but trying to pit the groups against each other is just stupid when most of us would be pretty happy just to get off this stupid rock. Contributing to negativity in the aerospace sector about anything other than weapons is a gigantic waste of time. Taking your points into account and looking back at the article, the only thing I might have removed is “single-stage to orbit (SSTO) technology” from the sentence “The Delta Clipper was an unmanned demonstrator launch vehicle flown from 1993 to 1996 for testing vertical takeoff and landing (VTOL) single-stage to orbit (SSTO) technology.”. The “Y” orbital prototype was supposed to test the SSTO tech so this whole program was a try at it, though it failed to get to that point. But my sentence implies that they tested SSTO tech with the DC-X and/or DC-XA and I don’t see where those vehicles did. Regarding this not being an orbital vehicle and not having reentry capability, the hardware built and flown wasn’t and didn’t but the “Y” orbital prototype was supposed to. Regarding their intentions back then, I can only speak to their documented plans. Regarding the Wright Brothers, I’m guessing you might like this one http://hackaday.com/2017/01/10/the-wright-flyer-engineering-and-iterating/. I would have loved to have been back there with them working with those materials and taking those methodical steps. I think you’re overlooking the fact that they didn’t have a deep-pocketed billionaire funding them. They were initially funded by DARPA and they were lucky to get any funding at all. They had problems for months because one administrator didn’t want to release any funds (that had already been allocated) at all. They had to count their pennies and use off-the-shelf and repurposed aviation hardware. For example, parts like welding rods and hinges were bought from a local hardware store, the engines were borrowed from Pratt & Whitney, the avionics were from an F-15, Burt Rutan’s Scaled Composites made the aeroshell and the first hydrogen and oxygen fuel tanks were made by Chicago Bridge and Iron Works. An article I read on the DC-X project back then mentioned they’d bought some door hinges from K-Mart. They were perfectly serviceable for the flaps and inexpensive. There’s likely many things on single use rockets where off the shelf common parts would be perfectly adequate, light enough, strong enough to be perfectly reliable, never fail during their single use – and best of all ridiculously cheap. But that’s not the way things are done in aerospace, not by the big guys. There was a company that built square rockets out of nested bundles of small diameter tubes. For staging the outer layers slid off the back. The ones they built and launched, trying to get launch contracts, used common automotive windshield wiper motors for fuel pumps. Cheap, way over-built for the short time they’d be in use. Dude chill out, the DC-X was a bare bones technology demonstrator used to test out certain concepts. Very typical in aerospace. Quite interesting to be sure and I would have loved to see how far MacDoug could take it. Also you cannot in all intellectual honesty compare it to the Falcon 9 that is fully functional and bankrolled by a very powerful billionaire. That said, the U.S. space launch capability is a joke and most aerospace firms are mostly welfare cases who can’t do anything anymore. It’s pretty sad to see how far we’ve fallen. Blue Origin hired a lot of the people who worked on DC-X and Spacex probably got a few too I would not be surprised at all if F9 is using the exact same algorithm for landing. Watch the video DC-X lands almost exactly like F9 even down to the suicide burn. Blue Origin did hire up a bunch of old DC-X people, but Blue Origin’s vehicles tend to have too much dry mass to operate as an SSTO. Really should mention BFS in this article, as it really is the spiritual successor to DC-X (and the spiritual successor to Shuttle, too, I might add…). Just to add to the discussion, three companies bid for the X-33 contract. McDonnell Douglas basically proposed a follow-on to the DC-X program. The claim is that Lockheed-Martin won because their bid included more new technologies than the other bids and included a $220 million bidder contribution which consisted of a mix of cash, in-kind use of existing company resources, and IR&D (Internal R&D) funds. There was a rumor at the time that NASA management overrode their engineers’ decision and chose Lockheed-Martin instead of McDonnell Douglas. I think the irony is that perhaps we could have had reusable, fast-turnaround spaceships years before SpaceX if NASA had chosen a more technologically conservative design. Oh well. There are remarkable similarities between Rockwell’s x-33 and the current darpa xs-1 project (Boeing, who bought Rockwell). Had the Rockwell or MD X-33 been chosen they would have been flying something by the early 2000s. Not in the same league as the others mentioned here, but the first rocket VTOL that I recall seeing were the rockets that Carmack and team developed for the X-prize contests. Watching it land looked almost fake back then. I thought the first one was prior to 2008, but this video seems to indicate 2010. They landed right back over the same small square indent in the concrete. Amazing. I recall following Armadillo’s progress too. Those X-prize days made for a lot of exciting projects to watch. Armadillo’s work is probably what inspired Spacex to try to do VTOL recovery as early on they considered using parachutes and ocean recovery. They probably even hired some ex Armadillo people when the company went under. On a completely different note, nice write up on the topic! The same problem clearly illustrated by the need for the handwavium Iron Man arc reactor to explain Tony’s magic suit. We need sci-fi energy sources to get sci-fi results. With Orion(nuke pulse drive) or even NERVA we can get some pretty cool results but burning hydrogen or hydrocarbons we are limited by those less energetic heavy reactions especially in Earth gravity/atmosphere, perhaps we can even do SSTO within these limitations. At least we can get into orbit and beyond with staging.